Since there is such national news saturation, the only real value of a blog is to provide a local perspective. This is, of course, very hard with Donald Trump in the White House since every six hours there is something head-spinning coming out of Washington. Well, it's a Friday, so let's do a Grab Bag with a mix of national and local politics and some other randomness thrown in for good measure. Quinnipiac released a poll earlier this week that produced the headline, "When thinking of Trump, US voters say 'idiot' is the first word that comes to mind." If the American people needed any further confirmation of their preferred description of the president, they need look no further than this photo. 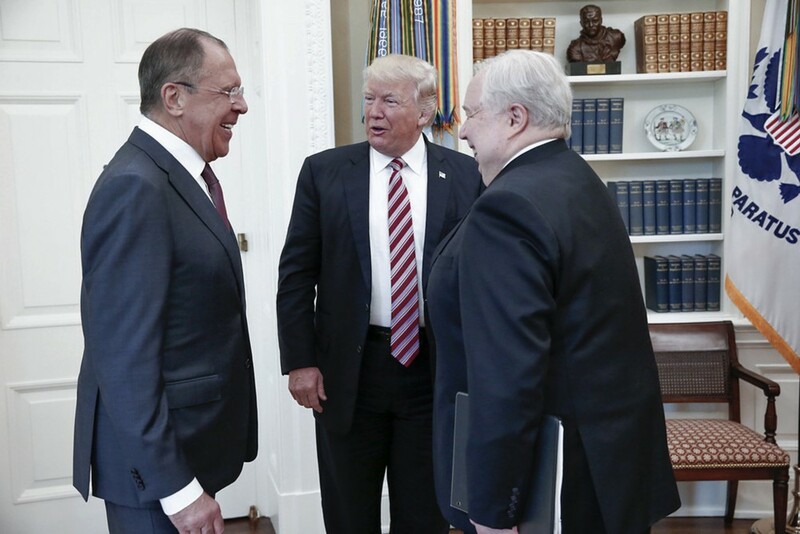 In it, Russian foreign minister Sergei Lavrov, left, and Russian ambassador Sergey Kislyak, right, visit Donald Trump in the Oval Office earlier this week. The White House had barred American press from joining the meeting but had allowed a Russian photographer to participate. The Russians then released the photo to Russian news agencies, leaving the White House staff feeling betrayed and lied to. This prompted former Obama national security adviser Susan Rice to tweet, "No kidding." If there was ever a graphic display showing the rewards of Russian meddling in the United States elections, this photograph is it. In it, the Russians demonstrate that they now have their simpleton fool to play with, a puppet dancing on their strings. Who owns whom here? The answer is painfully obvious. And btw, Kislyak, in addition to being an ambassador, is also considered a spy by U.S. intelligence services. Donald Trump invited a Russian spy into the Oval Office. He is an idiot indeed. In a wild City Council election year with many candidates running, Councillor Nadeem Mazen has announced that he will not seek reelection. Mazen's capacity to shape the debate on the Council was impressive, though from a distance, his policy ideas seemed superficial. Often criticized by his detractors for leaving the impression that he thought he was "the smartest guy in the room," Mazen nevertheless heralded a new kind of politics in Cambridge, tapping into the power of millennials while raising substantial amounts of campaign money from outside Massachusetts. Often aligned with fellow councillors Dennis Carlone and Jan Devereux, Mazen was sometimes hard to pin down on the most pressing issue in Cambridge today, the creation of more affordable housing, offering solutions that were more popular than they were pragmatic. Nevertheless, Mazen's willingness to hold himself to his campaign promise of two terms on the Council is refreshing. Where he goes next will be interesting to watch. And in a purely negative note, this beer is terrible. There is no other way to say it, and UFO should be embarrassed.